1609: Hey there folks! 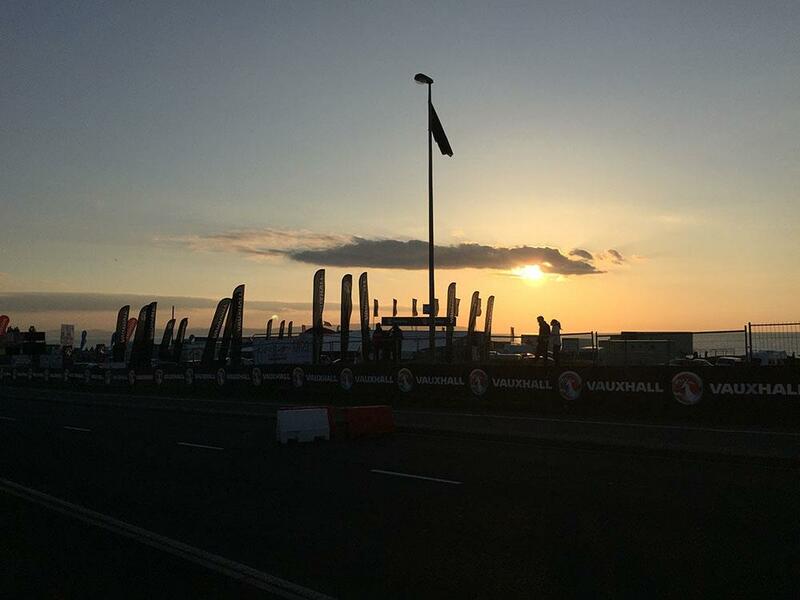 We're trying out something a little different tonight - we're going to be bringing you updates live from tonight's racing at the North West 200 as they happen. Keep refreshing the page for the latest news as it happens. Tonight's three races gets underway once roads close at 1715, with a six lap Supersport race, four laps of Supertwins and a six lap Superstock race all scheduled for tonight. 1618: It's still a beautiful night here on the Causeway Coast, with the sun beaming down despite a little bit of cloud cover. 1741: Roads are closed, the First Minister Peter Robinson has just arrived, and we're going racing as soon as all the marshal posts are prepped and the road signs are removed! 1749: The first race up tonight is the Supersport race. Alastair Seeley starts from pole position - as he does for the superstock race later and the superbike races on Saturday - but the one to watch might be fellow local Glenn Irwin. Already an established name in the British Supersport championship, he's fifth on the grid as a newcomer - and reckons only traffic and running out of fuel on the Gearlink Kawasaki prevented him from taking pole! 1810: Bikes are on the grid, road is clear - let's go race some motorbikes! 1817: End of the first lap, and it's Seeley out in front - but only just. 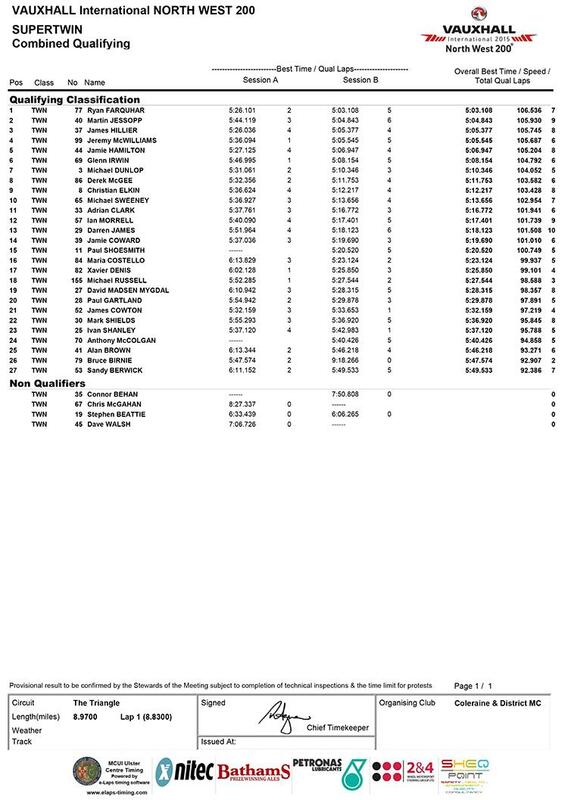 It looks like a British Supersport race, with Glenn Irwin dicing with his countryman. Irwin has actually led for some of the first lap, as has Bruce Anstey in third. 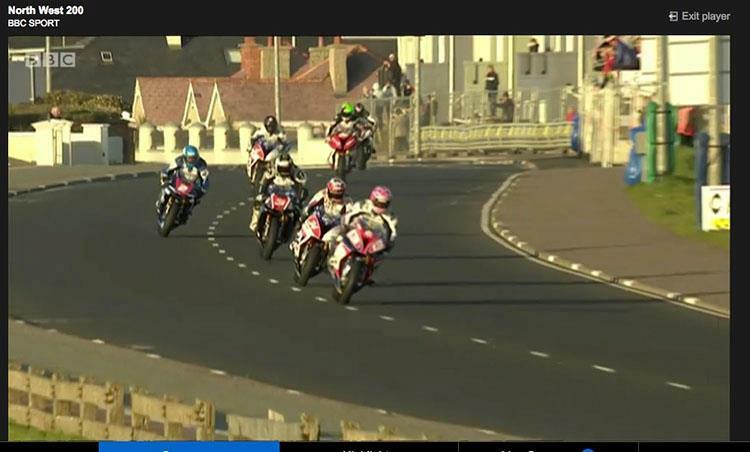 Michael Dunlop is right with them, while hsi brother William is a little back in fifth. 1823: End of the second lap and it's newcomer Irwin who leads them over the line! Seeley 0.096 back from him, with Dunlop 0.355 back from him. 1828: At the half way point Seeley takes the lap, but Irwin is right with him and they're trading the top spot constantly when they get into each others slipstream. 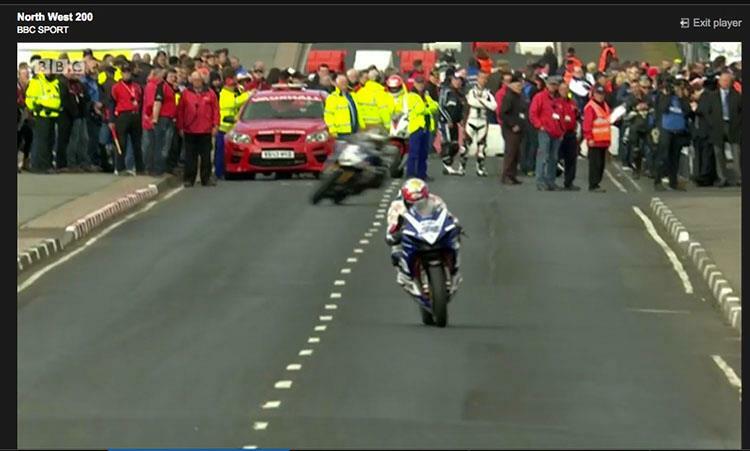 They've pulled a second on Bruce Anstey, who's made it up to third past Michael Dunlop. 1833: DRAMA! Irwin has disappeared on that lap - not sure yet where the Gearlink kawasaki rider has went missing, but looks like he's been caught out by a retirement. 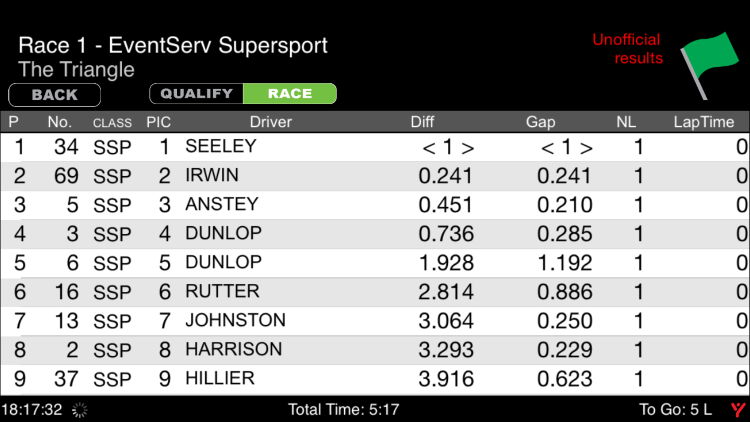 Seeley now in the lead by a second from Michael Dunlop, with Anstey 2.2 back on him and Lee Johnston up to fourth. 1836: Start of the last lap and a n ew lap record from Seeley as he pulls clear at the front. 1841: At the flag, Alastair Seeley takes the win from Michael Dunlop and Lee Johnston, who made it past Anstey on the last lap. 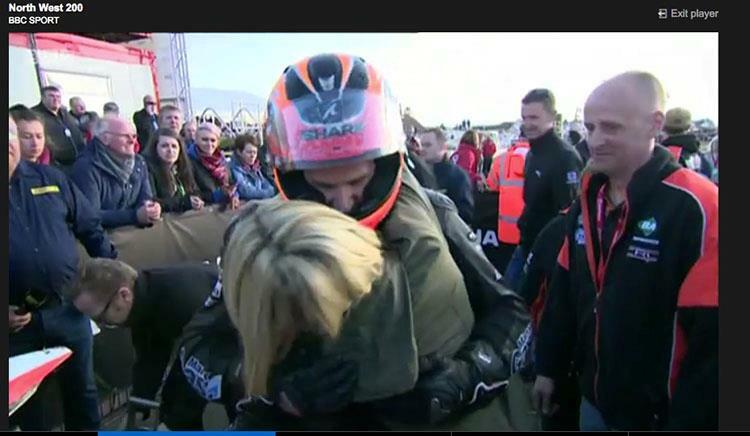 Win number thirteen for Seeley - can he make it fourteen in the Superstock race? 1855: Your Supersport podium (care of BSB racer Taylor Mackenzie, here with mate Lee Johnston). 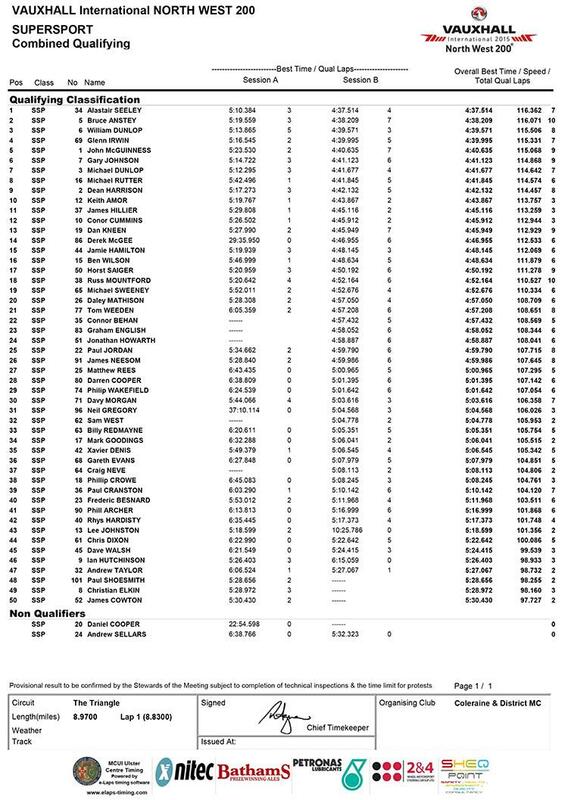 1914: One minute board in the Supertwins race, and it's returning legend Ryan Farquhar on pole. Two pre-race favourites out of the race though - no Glenn Irwin after bike problems and no Jamie Cowton after a crash in practice. 1920: No shocks there, but at the end of lap one Farquhar leads by nearly two seconds by teammate and former GP winner Jeremy McWilliams. 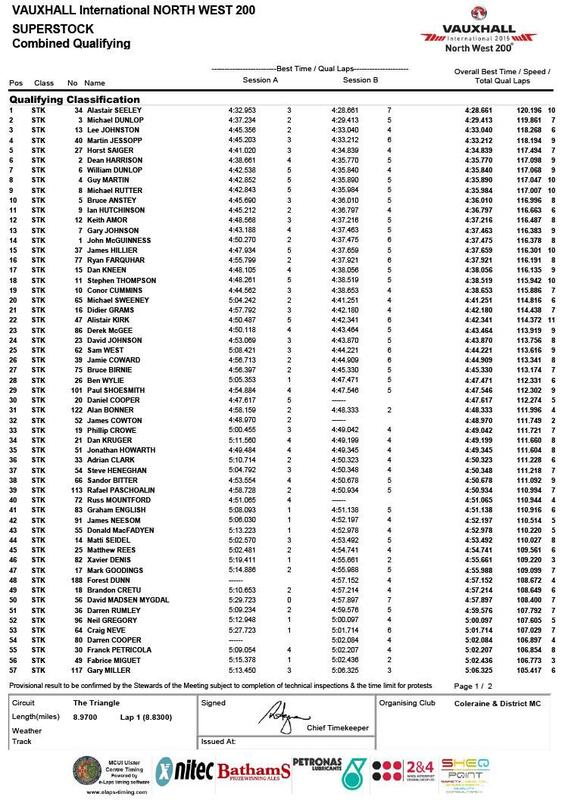 Former Farquhar protege Jamie Hamilton is 0.6 behind McWill in third. Sixty second penalty for front row starter Martin Jessopp after jump starting. 1925: McWilliams is on his spare bike after a problem with his number one machine, but a few fast sectors from Farquhar has maintained his lead at 1.5 seconds. Hamilton still third, ahead of Jessopp (on the track - his penalty will leave him about twelth). 1931: Fastest lap for McWilliams, and he's closed it down to only a second from his team boss as they start the last lap - but is it close enough? 1938: Farquhar takes the win, despite a sneaky look from McWill on the last lap at Metropole. 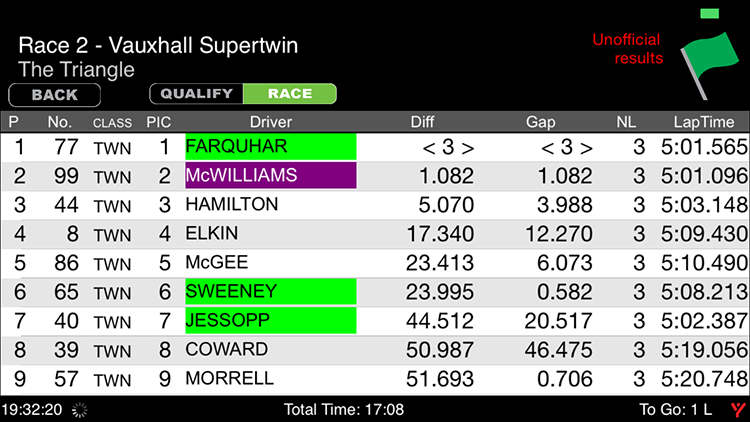 First international win for Farquhar from his comeback, and think he's pleased! Jamie Hamilton took third, ahead of Christian Elkin and Derek McGee. 1942: A few words from Supersport race winner Alastair Seeley. 1957: Next and final race - the six-lap Superstock - on their sighting lap. Hard to look past Alastair Seeley - he's on the bike he's spent all year racing in the National Superstock championship and he's on pole position. Big opportunity for Michael Dunlop and Dean Harrison as the new R1 gets it's internaional road race debut though! 2011: We've got a race on our hands here in the superstocks! A seven way battle for the lead so far, with Lee Johnston leading over the line from Seeley, Michael Dunlop, Harrison, Guy Martin, Martin Jessopp and Ian Hutchinson! Lead is trading places fast and furious as they slipstream down the straights. 2012: RED FLAG as they start the second lap. More news when we get it. 2014: Still no word but we're hustling through - a full restart (six laps) as soon as they can. Roads are only closed to 9pm. 2025: Roads have to open in 35 minutes, and there's speculation starting that we might not have time to restart this race. 2036: We're expecting an anouncement in the next few minutes that we're done for the night. Roads due to open in 23 minutes, bikes are cold, and the light is fading fast. No official word, but the First Minister's car is on the circuit as he prepares to leave. 2042: That's us done for the night. Good news is that they're going to try and reschedule the missing Superstock race for Saturday. Thanks for tuning in, talk to you all then! 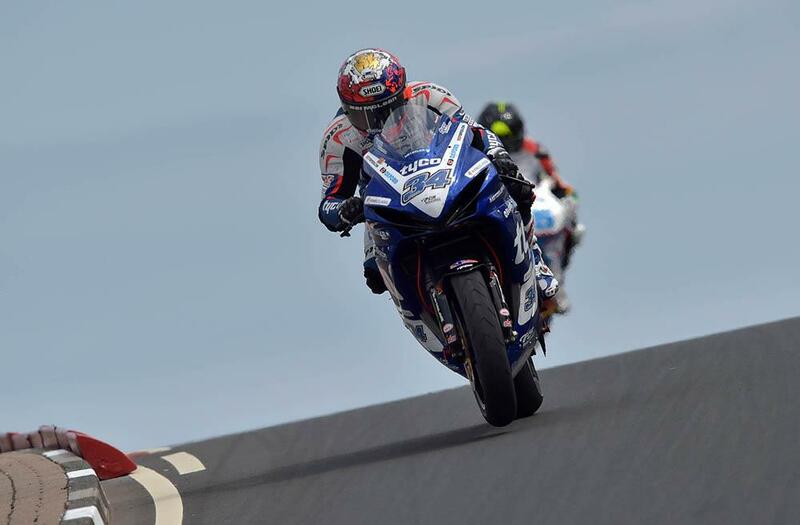 The flag falls on the first round of the World Superbike championship in Qatar this weekend.